Years and years ago, in 1997, I visited South Africa for the first time. That was three years after apartheid ended. Everything was different. Never had I seen so many children living on the streets. I was totally convinced I could change things for the better. I wanted children to be protected from violence. I dreamed that they would soon all be living in safe environments. I hoped they would get off the streets, attend school and be able to live a fulfilled life. We all have dreams. I was a bit blue-eyed back then, naïve one might say. I organized a charity event to support the development of long-term solutions for street kids in Cape Town. After the event and after I personally handed over the donations to the Marketing manager of a charity with an office in Cape Town CBD, I haven’t heard very much about their work again. It left me puzzled really, and it taught me to probably better work with established charities in the future. They have extensive knowledge and they know how and where to best put their expertise, to support communities all over the world. In Australia I had the chance to work with Oxfam, for a few years I volunteered in Marketing/Fundraising at their headquarters in Melbourne. I met so many interesting and like-minded people, people from different backgrounds that had one goal, to end poverty. I learned so much about development work, was invited to attend workshops and lunch-time talks, and gained insight in development projects. Over the years it became clear to me that tourism can create income for local economies, and preservation of nature (and cultural heritage) is a positive add on, and to this day I still believe that It is best not to give to street children directly. TravelchatSA - the biggest travel chat about South Africa. 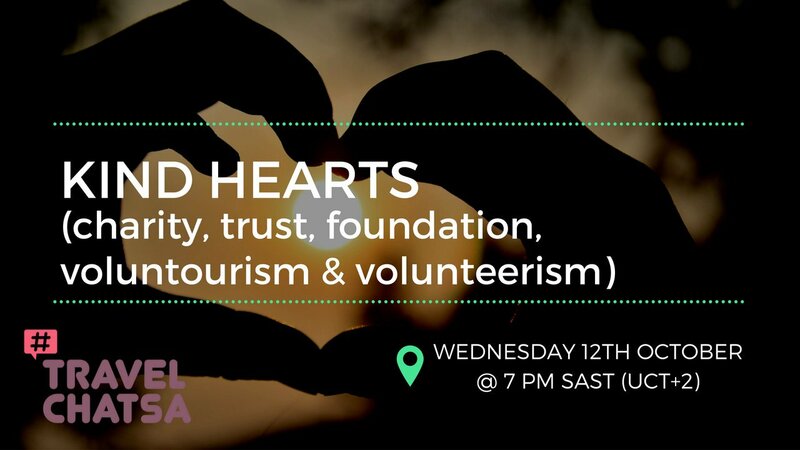 Today we talk about Kind Hearts on #travelchatSA. Come along to tell @travelopulent @AnksW23 @exclusivgetaway and @hot_oven everything you know about foundations, charities, trusts, voluntourism and volunteerism. Have a look at the questions first. Can’t wait to talk to you tonight.